The outstanding TV show is pleased to announce February air dates for Savannah, Georgia. We are pleased to air on the “Creative Coast”, Savannah, Georgia. The award-winning Editions with Terry Bradshaw is excited to announce February air dates for Savannah, Georgia. The informative program features compelling stories about every day topics like family recreation and unique travel destinations. Savannah is one of the nation’s oldest and most historic Southern cities. The provocative program will air on FOX WTGS-TV throughout the month of February at 8:30 AM on Tuesdays. 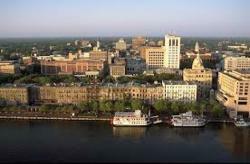 Visitors planning to explore “The Hostess of the South” will find Savannah charming, welcoming and a little mysterious. Its renowned historic district is downtown and attracts more than 10 million visitors in 2012. The city is also famous for its more than 30 ghost tours which take advantage of the number of local haunted homes and retell stories from the dead heard around town. It is also new relocation spot for retirees who are not interested in over-crowded Florida and it was given the highest rating in 2012 by Travel and Leisure Magazine for “Quality of Life and Visitor Experience”. The television program hosted by one of America’s greatest sports celebrities is pleased to continually broadcast in Savannah, Georgia. Terry Bradshaw, the former quarterback for the Pittsburgh Steelers, narrates the show with his usual down-to-earth personality. The Pro Ball Hall of Fame inductee is well-known as a commentator and analyst for various national television networks, and is now a co-host for an Emmy-winning pregame show. In addition, Bradshaw is a best-selling author and beloved late night talk show guest. His sense of humor and willingness to move an audience endears him to any motivational speaking crowd. He is either loved by fans or not, but still remains one of the best football players in the United States whose fans adore him. The award-winning Editions with Terry Bradshaw show explores topics which affect the lives of every one. It dives in to some of the best places in America to work, live, play and retire. The program films on location throughout the United States and Canada, and broadcasts on many cable television networks. For more information about the program and its host, please visit editionstv.com, or visit it on Facebook, Twitter and Google+.